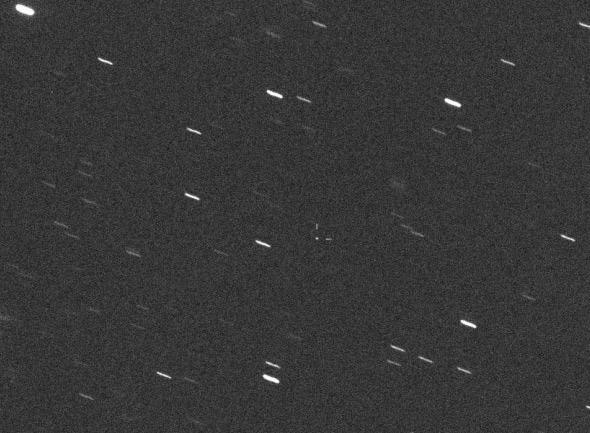 Asteroid 2014 DX110: Tiny rock will pass the Earth today. 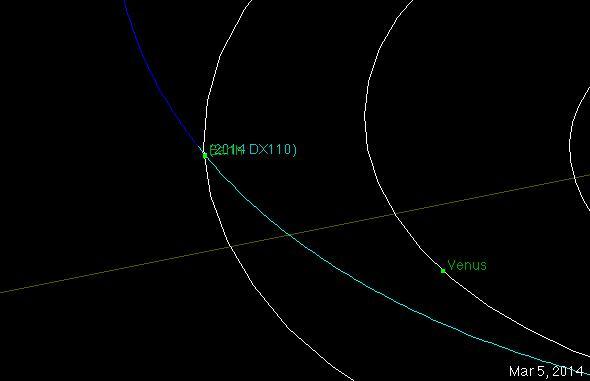 The near-Earth asteroid 2014 DX110 will pass closer than the Moon today. You can see it marked in the picture just below center and to the right. Click to spacerockenate. Photo by Gianluca Masi, Virtual Telescope Project. Used by permission. Note the update at the bottom of this post about a second asteroid that will pass us today. At about 21:00 UTC (4 p.m. Eastern time) today, the 25-30 meter-wide asteroid 2014 DX110 will pass just 350,000 km from the Earth—closer than the Moon! An orbital diagram for the asteroid shows it passing so close the labels for it and Earth overlap. Space is big—that’s why it’s called “space”—so in fact it will miss us by a decent margin. We’re in no danger from this rock on this go-round, which is nice; it’s somewhat bigger than the one that exploded over Russia in 2013 so I prefer it keeps its distance. But you can watch the pass live using the Virtual Telescope Project, an observatory that will follow the asteroid and send images out on the Web. The picture at the top of this post was taken yesterday, March 4, 2014, when DX110 was still about 1.5 million km (900,000 miles) from Earth. It’s far too faint to see with the unaided eye even during this close encounter, so your best chance is to see it online. You should know that rocks this size pass close to the Earth fairly often, but rarely hit us—a circle 350,000 km in radius has 3,000 times the area of the Earth! So we’re a pretty small target as things go. Averaged over time, a 25 meter asteroid is expected to hit us very roughly every 50 years or so, and would generally do so over the ocean and uninhabited territory. But rocks this size do hit us and eventually one will if we don’t do anything about it. That’s why it’s something we should be aware of and working on. Update, March 5, 2014 17:00 UTC: An asteroid called 2014 EC that was discovered only last night will pass the Earth just after midnight UTC tonight, sliding past us at a distance of just 56,000 km (35,000 miles) above Earth’s surface! This rock is roughly 10 meters across—half the diameter of the Chelyabinsk asteroid. A miss is as good as a mile, as they say, but it shows that there are lots of these things passing us all the time. There’s aren’t more now than there were; we’re just getting better at finding them. Thanks to Ron Baalke for the alert. Update 2, March 5, 2014 at 17:05 UTC: … and no sooner do I write the above update that I find out that 2014 EC has a very, very tiny chance of hitting the Earth in 2025. I do mean tiny: the chance is only about one in 144 million. Almost certainly, as more observations of this small rock are made, the chance of an impact will drop even farther; I explain how this works in an earlier post. No need to panic over this one. Correction, March 5, 2014 at 17:45 UTC: In the second update, I originally wrote that the chance of impact in 2025 was one in 2.7 million, but that is in fact a cumulative risk over several potential impacts over the years. The individual chance of an impact in 2025 is only one in 144 million, essentially 0. You can breathe even easier. Thanks to Ron Baalke again!